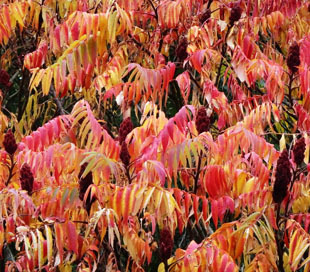 It is grown in gardens throughout the country. but it is much less common in northern areas. 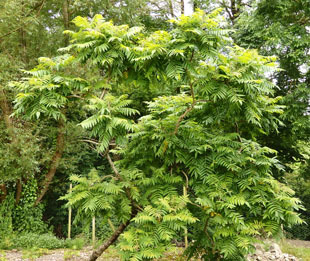 but was only recognised as naturalised in the wild in the 1960s. roads and railways. It spreads quickly by producing suckers. Male and female flowers are on separate trees (dioecious). 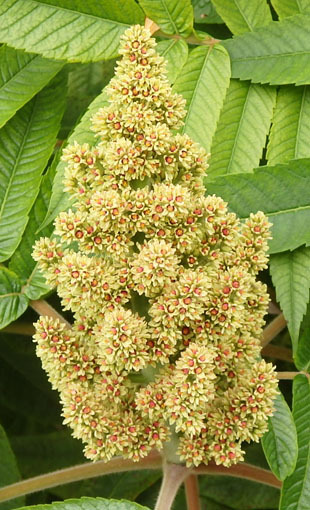 Male flowers are in clusters in a loose, green pyramid. 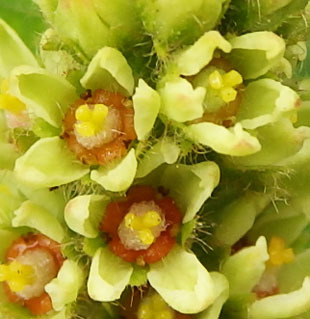 Each male flower has 5 greenish petals and 5 yellow stamens. 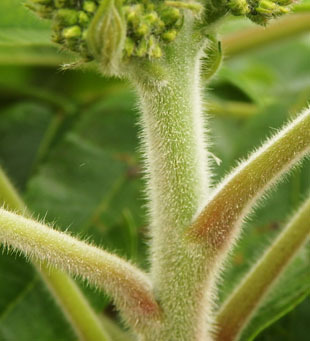 Female flowers are in tight, conical clusters up to 20cm. 5 green-yellow petals radiating hairs. 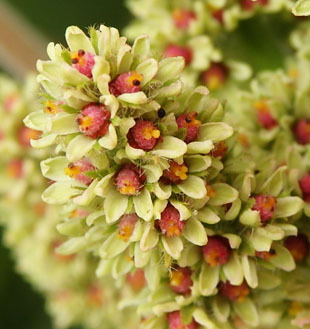 It has 3, capitate stigmas which fall off as the flower ages. 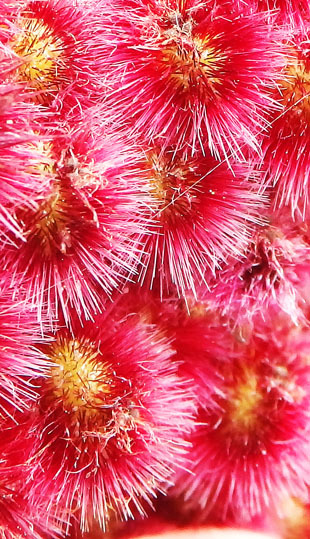 The flowers become scarlet when the hairs turn red. 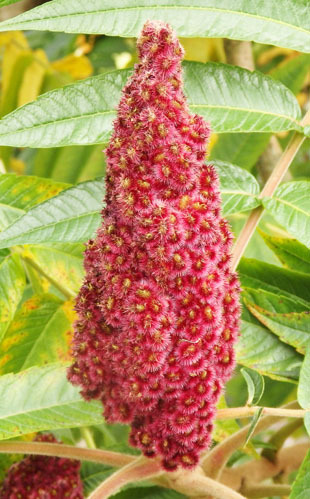 They form a bright red, erect, decorative cone. 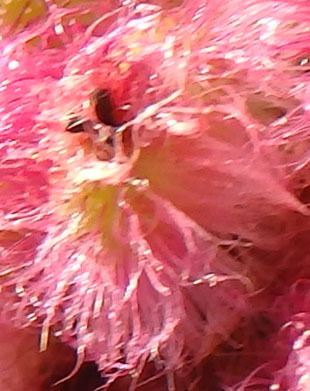 The fruits are small nuts surrounded by hairs. 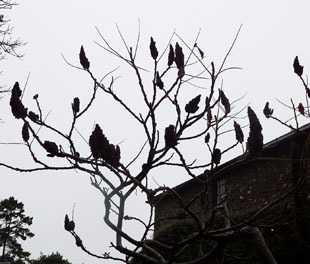 The fruits remain on the ‘cone’ and darken over winter. male flowers so I recommend these by Brian Johnson. 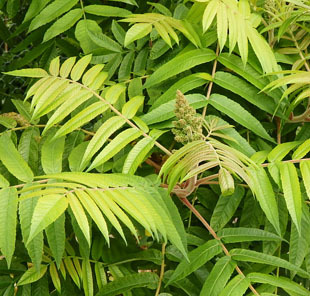 Leaves are green, pinnate and up to 60cm. 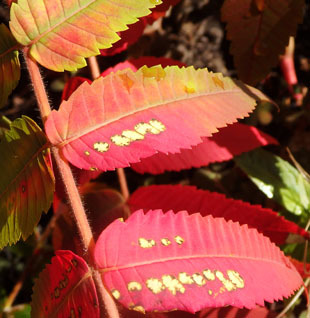 Leaves turn yellow, orange and scarlet in the autumn. Twigs are covered in velvety hairs. The trunk is much branched. Shallow roots readily produce aerial suckers. 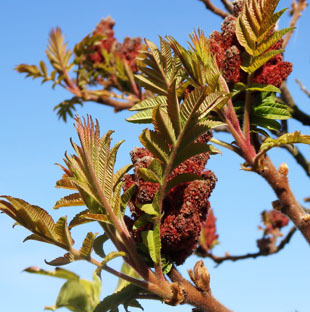 male or female trees, so few fertilised fruits are formed. Spread is mainly by suckering and fragmentation.